Definition: chord (kord)~noun: a group of (typically three or more) notes sounded together, as a basis of harmony. "Beethoven's Pastoral is no musical cul-de-sac. It's a radical work, and in it's final movement is music more purely spine-tingling and life-enhancingly joyful than almost anywhere else in his output." - Tom Service. "But however the case may be, the glory of unchaining the devil in music belongs to Montreverde. That was the beginning of modern music. Later, a new third was superimposed and they dared the chord sol-si-re-fa-la. The inventor is unknown, but Beethoven seems to have been the first to make any considerable use of it. He used the chord is such a way that, in spite of it's current use today, in his works it appears like something new and strange." Camille Saint-Saens. When I started playing the violin back in 1973, the program I was in also included classes in music theory and music literature. I began to learn the language of music, and its history. Seeing notes on a page is, for me, an almost magical thing. These lines and dots are the code for beautiful sounds. Music theory was not easy, and I found it did not get any easier as I continued to study it in college. But I learned enough to be able to dissect some of the wonderful moments that I came upon while listening to and playing music. Beethoven wrote his Symphony no. 6, the Pastoral, in 1808. If you are like me, it's hard to say which Beethoven symphony is my favorite because they are all so great. For a long time, I leaned towards his 7th Symphony as my favorite. But now I can't pick any one over the other. But I can pick the exact moment in his 6th Symphony that sends chills down my spine. 38 measures from the end of the fifth movement, "Shepard's song-Allegretto", in the middle of the final climactic fanfare comes a chord that completely sends the music into the stratosphere...a glorious Fmaj/sus9 chord that punches you in the gut and sends chills up your spine and tears into your eyes. The basses and trombones play the root...a low F, while the other instruments voice A, Eb, C and G. The violins, up high, hammer the G, which is the dissonant voice, and the horns hit an A, which is only a half step away from the G the violins are playing and BAM, as Saint-Saens said above, the devil is unchained. It is THE truly singular moment in the symphony. 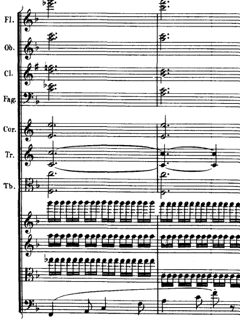 This dissonance quickly resolves when the violins take a step down to F, and we all come back to earth a bit. Saint-Saens noted further, "In the Sixteenth Century, it was not regarded as admissible at all, for one hears the two notes si and fa simultaneously and this seems intolerable to the ear." (fa refers to the fourth note up from do, and si in French is the ti we know and love, and is the 7th note up from do.) Played together, the si and the do clash dramatically. The tension of dissonance creates drama, tension and heightened expectations. The resolution of the dissonance brings peace and relief....at least that's the idea. Here is a great version of the final movement of Beethoven's Symphony no. 6. The big moment I've just described happens exactly at the 8:00 minute mark. (the climactic phrase starts at 7:44). This is the Chicago Symphony conducted by Sir George Solti. (Sorry about the advertisement before it starts).